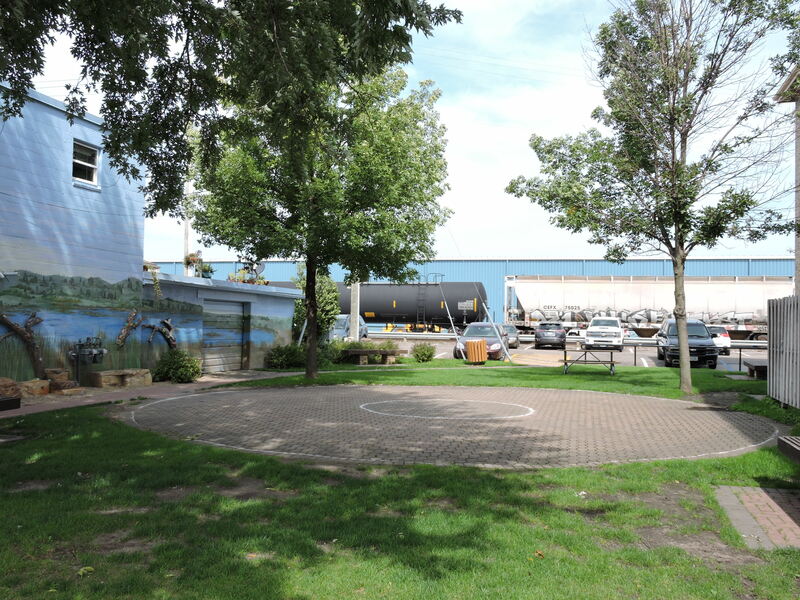 Perham, Minnesota [PUR-əm] has around 3,000 people, mostly of German and Norwegian descent. We stopped there to have lunch with our friend Jana who has a summer home on a nearby lake. Jana, who now has adult children, took us to the Lakes Cafe where she worked as a teenager. I had rhubarb custard pie for dessert. Over the years, I have had rhubarb pie and strawberry/rhubarb pie, but that was the first rhubarb custard pie I have had in 61 years. My mother made the last one. I don’t know if anyone else would care for it, but it was absolutely wonderful to me. Does everyone have some food where nostalgia rules the taste buds? Cindee Lundin created the three dimesional mural on the wall this year. We then visited Turtle Park, where the 40th annual Perham International Turtle Racing was held this year. They race turtles every Wednesday in June, July and August. We were there in September. The races were over, but it was fun to see the park. And yes, it truly has had competitors from all over the world. I have a feeling friends in D.C., New York and London might not understand. But it is these little traditions that make small town America special. 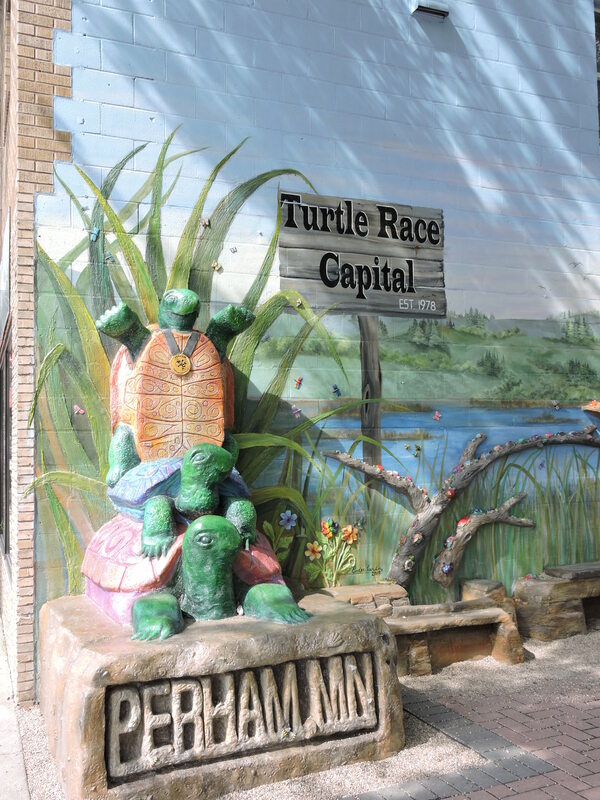 This entry was posted in Travel Logs and tagged Minnesota, Murals, Perham Minnesota, Small town America, Turtle Racing. Bookmark the permalink. It is interesting to see that the competeing turtles all have been painted and I guess it is for recognition etc. Real neat pictures. Thank you . Hugs to all. 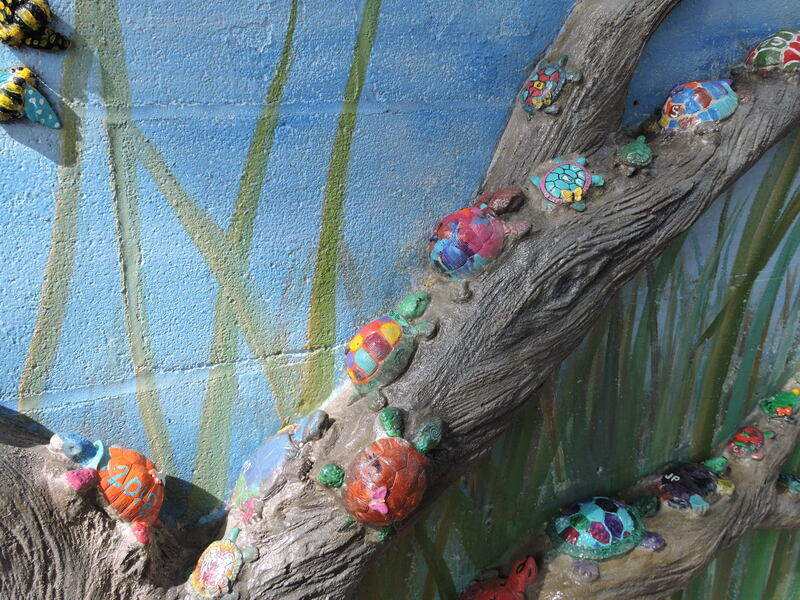 Those turtles were sculpted and painted as part of the mural on the wall. The races were over for the season by the time we visited. Very special. Love the edges where you travel. Food helps us travel down Nostalgia Lane like few other items, especially dishes our mothers used to make. I am glad that pie brought back wonderful memories to you. I bet a lot of people just went to the turtle races to see the wrecks. When I read that, I had to share it right away with Alie — she laughed out loud too.